A music venue that raised more than £80,000 to stay open says it is having to temporarily close while negotiations continue over its rent. The Cellar in Oxford was limited to a capacity of 60 people after inspectors ruled its fire escape was too small. Its owners launched a successful crowdfunding campaign for the building work, but say they can no longer afford to stay open. Manager Tim Hopkins said: "We are still hopeful for a positive outcome." The venue will close after the weekend. Mr Hopkins told the BBC: "We are still in talks with the landlords and a final decision is yet to be made." 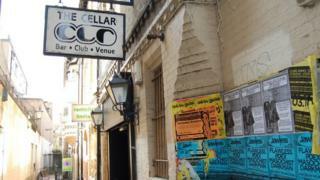 The Cellar's campaign was backed by a host of Oxford musicians, including Gaz Coombes, Philip Selway from Radiohead, Mark Gardener from Ride, Yannis Philippakis from Foals, and the band Glass Animals. Selway called it an "important part of the musical and cultural life of Oxford". Image caption Gaz Coombes said losing The Cellar would be "disastrous"
In a message to supporters Mr Hopkins wrote: "Time is sadly running out. We cannot operate at this capacity any longer, and as a result we will be closing our doors... we are hoping that this will be temporary. "However, unless we finalise a workable rent agreement and establish a firm plan to start building work... our closure will be permanent. "These processes take time and we are grateful to the landlords for trying to find a solution to our needs." He added: "There is still a bit of time left, so we do still hope we can save The Cellar and not let the people of Oxford as well as those further afield, down." Crowdfunders will be reimbursed if a deal is not reached, The Cellar has said. Landlord St Michael's and All Saints' Charities was not available for comment.